National paddlers website; trip reports, boat data, test reports, classified ads, and advice about paddling and paddling activities from around the country, free. 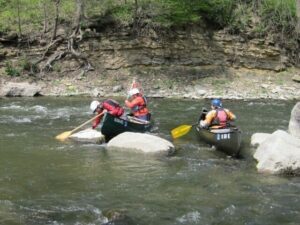 Cedar Valley Paddlers: club based in Cedar Falls/Waterloo. Annual events calendar, membership dues. Central Iowa Paddlers: club based in Central Iowa, members statewide. Annual events calendar, membership dues. Iowa Whitewater Coalition: group based in Central Iowa, membership dues. Saukenuk Paddlers Canoe and Kayak Club: based in Quad Cities, membership dues. Skunk River Paddlers: club based in Ames.